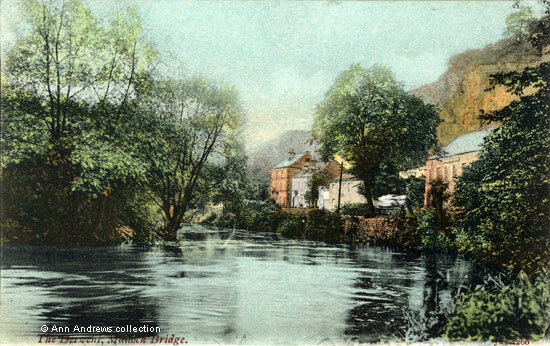 Fishing has long been a favourite pastime for Matlock residents and there were several good places to fish along the length of the River Derwent at the beginning of the twentieth century, when this picture was taken. The local papers carried stories of the fishermen's successes. For example, in 1906, whilst fishing near the Boat House, a Mr. J. Taylor "landed a splendid well-fed trout scaling between two and three pound, the fish being taken with the dock grub employed on Stewart tackle". Another report, this time from 1917, tells us that the Boat House Hotel had private waters and in that year trout weighing from 1 - 2 lb had been creeled. Not as good as Mr. Taylor's catch, but a good meal for the angler's family if the fish were taken home rather than returned to the river. The Boat House is the orange-ish building on the right of the row, with its stable block next door. "The Derwent, Matlock Bridge". JWS [J. Welch & Sons, Portsmouth], No.2266. Posted at Matlock Bath 14 May 1905. Postcard in the collection of and provided by and researched by and © Ann Andrews. "Derby Daily Telegraph", 17 May 1906. Angling in Derbyshire. "Derby Daily Telegraph", 5 July 1917. Angling in Derbyshire. For those who aren't expert anglers, along with the web mistress, a creel is a large wicker basket for fish.